Rabbi Dario Hunter is a valuable addition to CDI and C.O.W. When you meet Rabbi Dario Hunter, the first thing you’ll notice is his welcoming demeanor. Though he stands tall, his kind smile and confident voice makes one feel both engaged and at ease. Prior to our meeting, I had only seen him walking around campus a handful of times, likely dashing from one meeting to the next. Each time I saw him, he seemed driven, focused and proactive. Walking into his office, nestled between the other offices in the Center for Diversity and Inclusion (CDI), I quickly realized that he was these things, and so much more. Since coming to Wooster as the newest addition to the CDI staff, Hunter has settled into his new role with ease. Hunter works as the coordinator for both Jewish Life and Intersectional Programming, meaning his duties are twofold. As the coordinator for Jewish Life, he facilitates, assists and advises Hillel, the College’s Jewish student group, and the events they host on campus. As a member of the Religious and Spiritual Life department, he provides advisement and pastoral counseling for students as needed. Additionally, through working in the CDI in this role, he assists the department in events for not only Jewish students, but all students on campus. As the coordinator for intersectional programming, his job is to find connections between different cultural and religious groups on campus, and build bridges between those who would otherwise not interact with each other. Earlier this semester, Hunter helped the African Students Union and Hillel host an event to celebrate Sigd, a holiday primarily celebrated by the Ethiopian Jewish community. Rabbi Hunter’s background is full of rich and diverse experiences. Originally from Jersey City, N.J., Hunter was raised Muslim by his Iranian father and African American mother. As a child, he knew very little about Judaism; his schooling was primarily in Catholic and Islamic schools, and he knew no one in the community who identified as Jewish. To him, the choice to convert had seemed clear since his teenage years. After meeting with his campus rabbi during his undergraduate study at Princeton University, he began to outwardly pursue a reform conversion initially, and later an orthodox conversion after living in an orthodox community for some years. Even after going through the conversion process twice, Hunter’s intellectual engagement with Judaism hadn’t ceased. The choice to continue with his study and pursue the opportunity to become a pulpit rabbi stemmed from both an intellectual interest, as well as a spiritual calling. In the years between his conversion and being ordained as a rabbi, Hunter lived in and practiced law in multiple countries. After receiving both an American and Canadian law degree from the University of Detroit Mercy and the University of Windsor simultaneously, he ran his own private practice before teaching paralegal studies at the college level. He later moved to the city of Haifa in northern Israel for a number of years, where he practiced environmental law. However, the decision to move there stemmed from a more spiritual place. Hunter’s goal in moving to Haifa was to deepen his connection to “the Holy Land” and Judaism as it exists in the context of Israel. 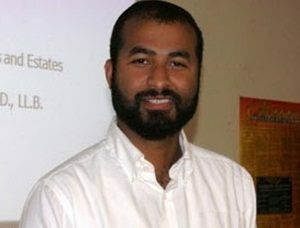 From his unique identity as an openly gay, Muslim born rabbi, and his experiences in practicing law and living in multiple countries, Hunter felt that he could bring a useful perspective to some of the issues not only within the Jewish community, but also the communities he lives in. In addition to working at the College, Hunter serves as a rabbi at Congregation Ohev Tzedek-Shaarei Torah in Youngstown, Ohio, as well as serving as a volunteer rabbi at the Ohio State Penitentiary. Arguably, his most impressive venture currently is his position on the Youngstown Board of Education, where he continues his community engagement by fighting for the educational opportunities for the children in Youngstown. According to Hunter, HB70 puts all administrative and managerial control of the school district in the hands of a CEO. This person may or may not have experience in education, might be more experienced in the private sector and might not even live in the district they are controlling. Yet, they will have total control over the district, and more authority than the elected members of the Board of Education. “I and some other outspoken board members, we use what we have: our voice. We were elected to do that, to speak for the public. And so some of the excesses that’s happening in Youngstown, we speak out against that whenever possible. We monitor what’s being done and what isn’t being done to make sure our children’s best interests are being served, and when need be, we talk to whatever state agencies to make sure the issues are being addressed, but unfortunately our hands are tied,” Hunter said. He, however, still sees a light at the end of the tunnel. Civic minded and compassionate people in the world give him hope for the future, not just in Youngstown, but for humanity as a whole. For those looking to tackle the issues around the world that speak to them, he suggests that people stay informed and continue to engage with those issues and march towards humanity’s progress forward. Overall, Rabbi Hunter has proven himself not only to be a great addition to the College community, but also to every community he is a part of. Through his commitment to his peers and to his fellow humans, he is a shining light in the world, and a man determined to make it better than he found it.